Shortly after Jonathan's last post, I headed out there with him to listen to the noise (which I hadn't heard until then) and see if I could work anything out. It didn't take too long before it became pretty obvious that something wasn't right.. .
We managed to narrow down the "noise" - which was really more like a "clunk" sound - to the declination axis - it only seemed to happen when the scope was slewing in dec. The clink noise didn't really seem to happen at the same point in the slew (which I theorised might indicate an issue with the ring gear), nor did it seem periodic enough to happen on every turn of the worm. What was slightly worrying though is that the OTA was being visibly deflected every time there was a clunk, and you could certainly "feel" the roughness in the motion by putting a light touch on the OTA when it was moving. As you might imagine, we didn't so this for long. My thoughts were firmly that this was a more "mechanical" issue, than any variation in the sound of the slewing caused by software/pointing model adjustments. This was both a good and a bad result.... the good news being that it couldn't be any problem with the worm or gear as the noise still happened when these were disengaged - the bad news being that it was now even more obvious that we have a mechanical problem to solve. The old "mechanics stethoscope' trick (using a screwdriver handle held to the ear and the "blade" touched to various parts of the mechanism) seemed to narrow down the source of the clunking sound to be the region of the dec drive assembly close to the pulley on the end of the worm shaft. This led to a working theory of a possible bearing issue. We didn't proceed with any more troubleshooting that night but did seek help and advice from both Grant Christie and Marc Bos (Stardome Curator of Instruments), and also to assess what options we might start looking into to find parts and repair if it does end up being a failed bearing. Another visit to Kumeu with Marc seemed to lead towards a general agreement that possibly a bearing may be the issue - but confirmation would require removal of the assembly for closer examination to narrow down exactly what the cause might be, also eliminating other possibilities such as the servo motor. 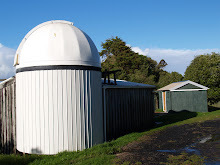 Permission was to be sought from Stardome (who own the mount on loan to Kumeu) for this investigative work to proceed. After agreement that the dec assembly really should be removed and examined with the aim of repair (either locally, or by sending back to the manufacturer) - Jonathan and I again headed up to Kumeu to remove the OTA from the mount again and remove the offending assembly as previously discussed with Marc. It didn't take too long to carefully remove the dec assembly from the mount. Once on the desk, loosening and removing the belts (well one of them - the other had already had to be removed with the motor to remove screws bolting the assembly to the mount) - it became obvious that whilst the motor and pulley shafts were both very smooth to move - the worm shaft was anything but... 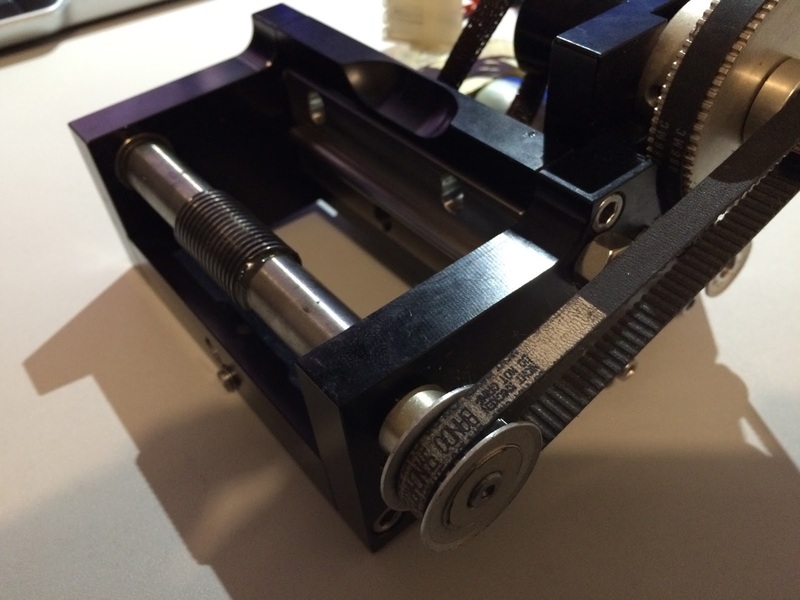 The rotation of the worm shaft was very rough, even "binding" occasionally - certainly not the feel that precision rotating parts should have. Next steps will be to have Marc, and our other engineering experts take a look and see if we think this is something that we can have repaired and set up locally, or whether we package it up and send it off to the US. In other news - you might recall a few blog posts back that I had been having trouble getting a response from the dome rotation "azimuth" sensor. Well, whilst the scope has been out of action, we took the opportunity to get electronics wizard, and dome rotation expert Tony Burns out to the site to have a look and give us his valued opinion. We ended up removing the sensor and the board and he took it away to check. Turns out there were a few problems with the system - so it was a good thing we did. Firstly there was actually a problem with the USB board itself - at some point in history a short circuit or similar had caused some damage on the board (lifting some of the copper "track"). Also - and probably unrelated - there was an issue with at least one of the input channels that needed investigation. Tony replaced the control ICs on the board and repaired the broken track - effectively returning the interface board to "good as new" condition. The Azimuth sensor however was not quite a simple. The postion of the sensor (as I've mentioned before) is very close to the dome slot in the open position. This means that there's a very good chance that any moisture may find its way into that area (as the dome is opened, or closed, usually in that position). Add to this Auckland's very humid climate - and there is a very good chance that corrosion might at some point give some trouble. Looks like the connections to the photosensor and IR LEDs has corroded away - meaning there was no chance of this working!. Tony has fabricated a new set of optoelectronics for the encoder wheel using much more robust connections that will hopefully last many years to come. All that remains is for this all to be reinstalled and tested - and hopefully the "break" we've just been forced to have will give us the opportunity to do this over the next few weeks.